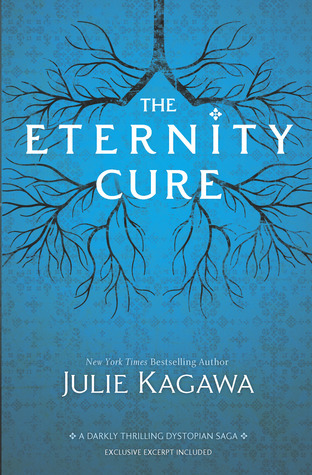 I really enjoyed the first instalment of this series, THE IMMORTAL RULES, and found a preference for Kagawa's writing when she's letting her darker, grittier side roam free, rather than her more colourful world of the fey. The dystopian, post viral-apocalyptic elements only add to the stark backwash of this already dangerous vampire-filled world. Allie spends much of the book trying to further comes to terms with her new undead status. This is only emphasised by the reappearance of Jackal, one of the main antagonists of book one, and her very own blood brother. Jackal is without doubt the black sheep of Allie and her sire, Kanin's, dysfunctional little family, and his disregarding attitude towards humans, or "blood bags" as he likes to call them, is a sharp change from Allie's own softer opinions. Allie hasn't yet let go of her humanness and has to keep reminding herself that she is no longer one of them. She is, quite literally, her own worst enemy now. The thing that as a Fringer, she despised above all others. It's a lot to absorb, to accept, and this book took that concept and ran with it to great effect. I have to say, I had brief moments with the character of Jackal where I wondered if he was going to end up being not as evil as we once thought. He's snide, condescending, rude, and let's not forget, the guy that staked Allie and chucked her out of a skyscraper window in book one. But he's also realistic, pragmatic, and there were hints that there may be reasons why he's become the vamp he is. Aaaaand then he'd say something repugnant and we'd be back to square one. His character is more than a little confusing, but I'm still hoping there's something in him worth saving. For people who love a good anti-hero, I suspect he may end up being a contender for that role. The other character of note in this series is, of course, golden-haired good guy Zeke. He was last seen tucked safely away in Eden, the only vampire-free community left in America (I think, don't quote me on that, but certainly the only one Allie and crew are aware of). Knowing he was safe was all that was keeping Allie going as she followed the call back to her sire, in effect, retracing the steps she took in IMMORTAL RULES. But even with that blood call pulling at her, and her sire's torture invading her dreams, Zeke is never far from her thoughts. Her time with him, helping his "family" move across treacherous grounds to reach the haven that is Eden, profoundly affected Allie. It reinforced her desire to stay human and to never become anything like vamps such as Jackal. But her time spent with Jackal in this book, has an almost equal impact, and as much as she tries to block him out, he also affects her. She is a monster. She has killed and she will continue to kill, just as he does. So what is the difference, really? All these things and more are addressed and somewhat resolved in this book. The Red Lung virus and the possibility of a cure is what drives much of the action as well as Allie's desire - compulsion, even - to rescue her sire from the demented Sarren. There was also a huge game-changing event at the end which has me thinking the next book is going to be something else entirely. Can't wait.